What does the inauguration of Barack Obama mean to you? "Everything." 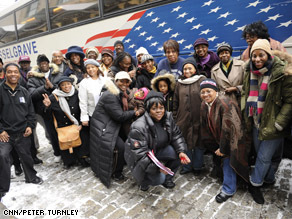 A group of African-Americans ride a bus from Brooklyn, New York to Washington DC on Sunday, Jan.18,to attend the inauguration. A New Yorker on his way to the inauguration. On the eve of the inauguration of President Barack Obama as 44th President of the United States, and on Martin Luther Kings' Birthday, thousands of citizens arrive in Washington DC and visit national monuments and historic sites. On Sunday morning, I boarded a bus in Brooklyn with a group of approximately 40 citizens from New York, all African-American, each of whom, would not have missed for almost anything, the inauguration of President Barack Obama. I have been a photojournalist for the past 25 years, and have had the incredible opportunity to witness many of the worlds’ defining moments of modern history; the fall of the Berlin Wall and the end of Communism in Eastern Europe in 1989; the end of apartheid in South Africa and Nelson Mandela walking out of prison in 1991; and most of the worlds’ conflicts of the past three decades. When our bus pulled into Maryland, on the eve of the inauguration, I knew after hearing the words of my fellow passengers, in some sense fellow pilgrims, that I was in the midst of a moment of history like maybe no other in terms of its historic magnitude, that I had ever witnessed and certainly not in America. It is the words of these passengers, and those of many others that I have met in the past two days, that are representative of some degree of what this moment means. I would prefer to let them speak for themselves. Yemaya Hayes, a resident of Brooklyn, who rode to Washington DC on the bus on Sunday reflected on the moment and the trip and said, "This is a pilgrimage. We all say-if he can do it –I can do it. We are going from Brooklyn to Washington to make history. Our stories have always been told not written. Our ancestors couldn’t read or write-our stories were told my word of mouth. The only way out is to go back through-to relive the past. I like being on a bus because you can see everything-it is leading up to the triumph-it is like riding up to the future and saying bye to the past." 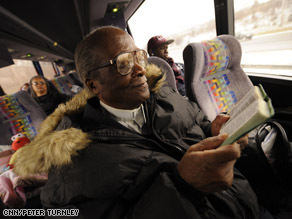 Another passenger, Reverend Clifton Phillips Mandrane, 79, born in Harlem led the passengers on the bus in prayer before the trip. He was in jail in 1962 in Albany, Georgia for protesting without a permit. He was jailed with Dr. King for six days with no food, "This trip is a fulfillment of time. I believe that Americans have achieved the goal of liberty and freedom for all. I couldn’t attend Dr. Kings speech and the million man march-this is a great opportunity because I am aging. I used to have to ride the back of the bus-but we fought it through protest and the courts-this is about change. I’m still in college pursing my BA degree. Today the battlefield of the civil rights movement is in the public schools. If we don’t help young people-we won’t have future leaders. Justice for all-that is what democracy is!" Denise Orisha Suares lives in Harlem. "I'm here representing my mother, my grandmother, and my great grandmother-the women that raised me. It is sweet sadness. They never thought they would see this in their lifetime. For them, being safe, and getting a good job was the best they could ask for-never being president. Michelle reminds me of them . Sometimes you are not appreciated for being a strong black woman. She has made it positive for being who you are. The transformation of change for the black race has always been on a bus. I now feel like I'm an American. I believe there is hope that we could be one people-I've never felt that possibility before. We can step out of our skin color. Every man is going to be able to take off their costume. I don’t know how I am going to feel when I get to Washington. But I feel that I have already won!" When asked if riding to Washington on a bus had any particular significance for her, she replied, "the bus is so reflective of the people it is carrying-it breaks down and gets fixed-something always going on." At one point the bus stopped for a mechanical failure and Denise commented, "the bus is like our collective experience- a little resistance-but we’re going to keep going." Colette Winlock, a friend of Denise Orisha, reflected as we rode towards Washington and said, "back in the day-the bus was a way we left home and the way we got sent back-how we stayed in touch with our families." At one point during our bus trip, the group played a trivia question and first person getting an answer right received an Obama pin. One of the first questions caught my attention by its' irony, "What country could Sarah Palin see from her house?" Arnold Freeman, from New York, brought along five boys on this journey to Washington and commented when asked about this trip, "I was at the million man march. I never experienced a spiritual feeling like that. I brought 5 boys with me-I wanted them to experience the power of this collective gathering. Being on a bus gives me the feeling of being with people that feel the way I feel. I worry that people expect Obama to solve their problems of their own community. We shouldn’t depend on him to do what we need to do. This is destiny that was set up by Marcus Garvey, Malcolm X, Shirly Chisholm, Dr. King. I teach my sons that this is a collective experience. This election represents this. We can no longer say that because we are black that we can't! This frees children of a sense of limitation." Laura Hunt, a surgical nurse in New York shared her feelings about her ride to Washington, "this trip means hope in general. We finally have great role models. Hope sums it up for me. It makes me want to aim higher personally. It is inspirational. I'm feeling energy among other people-unity. This bus trip stands for unity. I feel more connected to the political process because of their being black leadership. I think the inauguration will be even more dynamic than election night. I feel more empowered as an American than previously. I feel that certain needs will be addressed. The needs of the under-served and the undeserved, I mean that in terms of the people that have been in power previously-that saw the world between those that have and those that have not. The fact that 47 million white people voted for a black president means they know the deal. What is unique about Obama is that he has been so many places-has seen so much. Some things that are based on money won't change unless programs are put in place-like education. The way things are set up-presently only certain kinds of people have access to certain kinds of things." After spending the night with my new friends in Maryland, I said goodbye and got up early and arrived in Washington DC on Monday morning. Throughout that day, I wandered public areas of Washington where I saw thousands of citizens that had made their way to DC for this momentous occasion. I continued to photograph many people I encountered and continued to try to ask the subjects of my images questions about their feelings and emotions surrounding their visit to the nations capitol. "I came to be part of history-to know where you were when it happened. This represents hope for future generations. It is an opportunity to aspire to whatever you want to. We still have a ways to go. People have opened their minds to having the same rights. It changes how I feel about myself. The sky is the limit. More people can now raise the American flag." In front of the Vietnam Memorial Wall, I encountered Jose Oakley, from Hernando, Miss., who was looking for the name on the wall of his brother; "I came here to see Obama for history and to see my brother who died for his country. All of those before us sacrificed so we could be here." Another teen age boy standing at the wall being photographed by his friends holding his hand in front of his heart, Michael Hope from Keller, TX. replied when asked what the election of Barack Obama as president meant to him, "this means pride, confidence, joyfulness!" At the Lincoln Memorial, I discovered many visitors being photographed in front of the statue of Abraham Lincoln. Felicia Taylor, from Macon, Georgia, who stood in front of the statue holding he daughter, Kenedie Harris, commented, "It’s a moment for our whole family to see a historic moment for our nation." Finally, this morning, on this exceptional day of American, world, and human history, Utha Knox, 89, from Virginia, one of the of the famous all black squadron of flyers in World War II, the 332 Fighter Squadron of the Tuskegee Airmen, summed up much of what this day could mean when asked what the election of Barack Obama as president meant to him, "Everything, everything possible." It means the world to me...it means that all of the people that died for freedom, all of the people that marched for freedom, all of the people that rallied for the rights of workers, all of the people that worked for everyone to be able to "sit at the table"… their lives were not shorted in vain!! It also means that a progressive like me, may even see if her life time, substantive change and a transformation in a country I love. Ok folks, anything in America is possible! History has been made and we can turn the page and look to the future. It seems most people, including myself have a good feeling because we "EXPECT" positive things to happen to our great nation, especially after such a negative preceding Administration. Attitiude alone cannot straight out our nation's woes, yet it's a great step in making positive things happen. Personally, I will now hold President Obama to the same standards of success that I've held all prior Presidents. For the sake of ALL people in our nation, I wish him and want desperately for him to succeed. When he is successful, we are all hopefully better off and thats really all we can expect from our President, regardless of his ethnic background. That is a standard that should apply to all our leaders. Beautiful! Thank you for sharing your story. My grandfather was drafted for WWII. He rode a bus from his home in Illinois to a base in Florida. When the bus stopped for dinner in Georgia the black men, US soldiers, were not allowed to eat. My gradfather carried food back to the men on the bus. Nobody denies that African Americans have suffered terrible injustice in our history. In the past 20 years there have been many very successful black Americans and the inequality has been reversed in most areas of the country. I hope that people who see Obama as a black man have seen an event profound enough to trigger positive change in their perceptions. Those who see him as a black man are still clinging to racism. 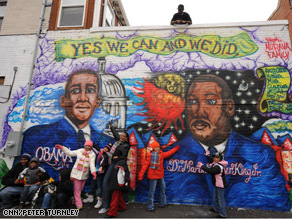 As MLK said, only when we don't note the color of his skin will we triumph over racial prejudice. My advice for Mr. President is to avoid all the negative comments from people who tells you to "resign" and keep moving forward because we know YOU CAN and we will help you move forward.God Bless you. What does this day mean? Most white people will never understand what this means to black america.We have sat quietly for years when you winced when we got to close.We hid the anger when you were surprised to find we aren't all "ghetto" We kept our mouthes closed when you asked could you touch our hair,weaves, braids.It was different and you were in awe.But different is just different.We bit our tongue when you white america,asked questions like "why don't you have insurance? Or "You mean. The children have more than one father? Like you, we make mistakes.We even held back our hand when you made comments about the different hues of our skin.Does this scare you we wonder? We are not a race to be feared or hated.You don't even know us.Have you even tried. I am ashamed to admit that the high school where I work did not even acknowledge the inaugauration- no explanation given, especially given the fact that Iowa was responsible for President Obama's first successful caucus. I monitored a small study hall during the swearing in ceremony and I gave my students two choices; watch the inauguration in secret with me or go to the library because I wasn't going to miss the most historic event of my lifetime! I was so proud of the six who chose to accompany me. They were glued to the TV and when the instrumental quartet played, you could have heard a pin drop. What awe that event inspired! Most ironic is the fact that an African American will live in a mansion built by slaves. Those old souls must be dancing in heaven! I pray that in the months to come, the message of unity will reverberate and all will reach out to each other with open arms, not closed fists. Pay it forward!! I recntly saw on CNN, that Obama's election has inspired Africans in Iraq, who are oppressed to this day and segregated against to begin pushing for office positions in their own country. This is incredible to hear. As an immigrant who know more about Black History than what America chose as Black Histor, I am extremely proud. My son is a born American, but clings to his Caribbean roots that mean more for a black than American roots. Not all Caribbean Islands are third world as thought to believe. We are a proud people who in my case face migrating to a nation not by choice. Having a pretty good life only to be faced with the wrath of racism in this country. Growing up I too was a product of white and black, and did not face poverty. Proud to be raise by a very intelligent white woman who taught me to never stray from my roots. It is a great day in America. Rolan Martin and Christian got it right and said it right. More of the world are people of color than America wants to accept. That is why we have President Obama at this time, at this moment, and all will be well. The Good Old Boy System of this Nation is fading. Everyone should look at the statistical data to support what I have said. Some are doing such in the media, but this should be a daily discussion.